Palm Avenue is Getting a Face-lift with the Otay Mesa-Nestor Community Art Box Program (Artistic Murals on Utility Boxes). Local Artist Josue Mergio, a Southwest High School graduate will be painting new Community Art Boxes and touching up existing Art Boxes. Utility Boxes on Palm Avenue between 13th Street and Saturn Boulevard Will Be Painted with Themes Reflecting Living by the Pacific Coast. The program is set to start any day now and will be done by January of 2018. The program is run by Chairman and Otay Mesa-Nestor resident Rodel Reyes. This is just one of many parts of the Otay Mesa-Nestor Palm Avenue Beautification Committee (OMNPABC) from 13th Street to the I - 805 Freeway. Recently works include (1) coordinated with Caltrans (District 11) in 2015 to rehabilitate Palm Avenue Landscapes/I - 5 freeway (south and north bound) exits including Palm Avenue Landscapes at Saturn Boulevard with decorative mulch/wood chips (2) coordinated with Ocean View Church (2460 Palm Avenue, San Diego, CA 92154) in 2013 to establish a Caltrans Adopt-A Highway Litter Maintenance Program at the Palm Avenue Landscapes. 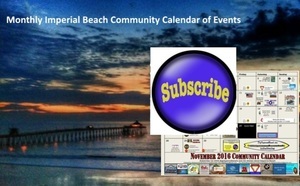 The OMNPABC is co - chaired by Otay Mesa-Nestor resident Rodel Reyes and Imperial Beach resident Travis Brazil. A special "Thank you" to Rodel Reyes for his help with this article and supplying us with the photos!